Can't really imagine old Bogey in his shorts to be honest, but this part of the Upper Keys has stayed a Florida Keys movie classic anyway, appearing in many different films over the years. And as for the 1981 number one song Key Largo by Bertie Higgins....nah, again it doesn't have an awful lot to do with the place itself. Before you have done no more than 40 miles from Miami you will begin travelling across the water down to the Florida Keys, and this island is the first one that you will come to. Stretching to a length of 33 miles (53 km) it is the longest of the group of islands that make up the Florida Keys, and it was with this in mind that the Spanish decided to call it Cayo Largo which roughly translated meant Long Key. Those Spanish…..they so knew how to come up with a witty name. Good thinking guys. Come up with a winner there! As with most places that you might travel through on your trips across the globe, you will find that the island can be split into several smaller areas. The first one that you will come to is North Key Largo near the Card Sound Bridge. The bridge is a massive toll causeway which connects Southern Miami-Dade County and northern Monroe County, and you will have seen the bridge in many films such as James Bond, and Arnie's True Lies. It really sends a thrill through me each time I leave mainland Florida and start heading up into the sky across the water. It is one drive that I never get fed up of doing. Then the middle bit of the island is actually called Key Largo, whilst the bottom bit is Tavernier. 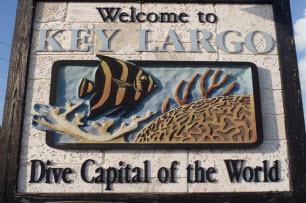 Key Largo has attractions that are worth checking out, so make sure you take a look at our full list of Florida Keys attractions and of course our other one looking at Florida Keys free attractions that you could stop off and see why you are here. 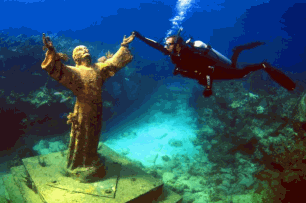 The island is an extremely popular diving resort and attracts divers the world over. It even gives itself the name of the diving capital of the world, and if I am honest with you, not being a diver myself I can't tell you whether this is true or not. But it certainly does have a lot of reefs and areas of natural beauty around its shores, as it has in easy reach the Everglades National Park to the north-west, and John Pennekamp Coral Reef State Park and the National Marine Sanctuary that govern the Florida Keys Waters being just two others. John Pennekamp Coral Reef State Park to the east, is certainly worth mentioning as it has a bit of trailblazing history. John Pennekamp holds the status of the original underwater park in the North American continent. If it is nature you enjoy, mixed in with a bit of exercise then this northerly island in the Keys will be right up your street. Being close to the Everglades gives you massive opportunities to hike, bike or Kayak through areas of the everglades few people ever see! Hire a local guide for the day, who has personal in-depth knowledge of the area and they will show you alligators, owls, raccoon and snakes. It sounds a bit scary, but believe me you will be enthralled as their passion of the subject leaves you with nothing else but great, long lasting memories. The island has great restaurants which have very distinct decor,and food to die for. You can easily find a place that is great for a quick laid back snack, or maybe you want to spend a bit more and have a luxury eating experience with someone special? Well the following list is what we would consider as worth trying . All of them have been tested out, and some we have been back to a few times, so we feel pretty certain that your lunch or evening will be a pleasant one. If you do follow our advice then please remember to leave a review of your trip, so we can become the number one resource on restaurants in Key Largo, Florida Keys. But of course there are times, when you simply want to go out, get out on the dance floor and cut some shapes. Or sit in a bar, getting a bit tipsy whilst telling the barman (that you had only met a few hours earlier) that you love them madly. So where do you go in Key Largo that is fun. lively , or best of al stays open really, really late? You don't want to be grooving in the afternoon do you! My favourite is probably Coconuts, that has a dancefloor great drinks, and a bit of karaoke too. Yeah, move over Mr Michael Bublé Im coming through! After you have been diving, kayaking, driving, dancing, eating.....ok, ok I think you get my drift, you will need somewhere to rest. The beauty of Key Largo hotels and motels is that they are much cheaper than the majority of the places you can stay in the Florida Keys. You'll find the closer you get to Key West, the more your bank balance will take a pounding, so its nice to get your monies worth whilst you are hanging around the Upper Keys. Visiting Dolphin Cove is like most dolphin based experiences a memory that you will hold for life. Based around five acres, Dolphin Cove sets out not just to fill your day with fun, but also to educate too.